If you’re frequently going on hiking or camping trips where there are lots of bears around, you might ask yourself how fast do bears run. But it’s even better to ask yourself what you can do in case of a bear attack, and that certainly isn’t running. 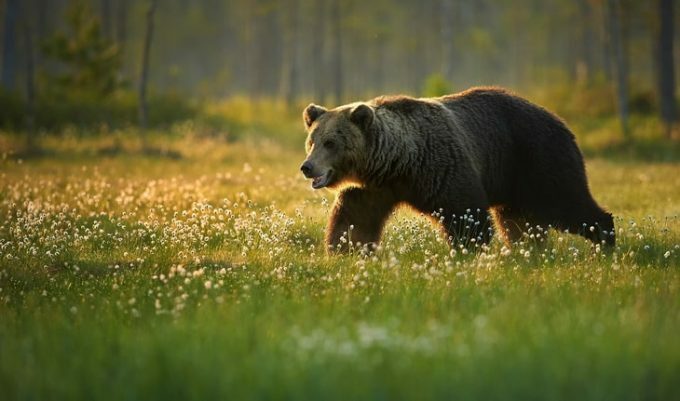 We’ll explain everything in this article, starting with their speed, how long they can keep running, how that’s possible and we’ll end up with means of defending yourself in case you come face to face with a bear. 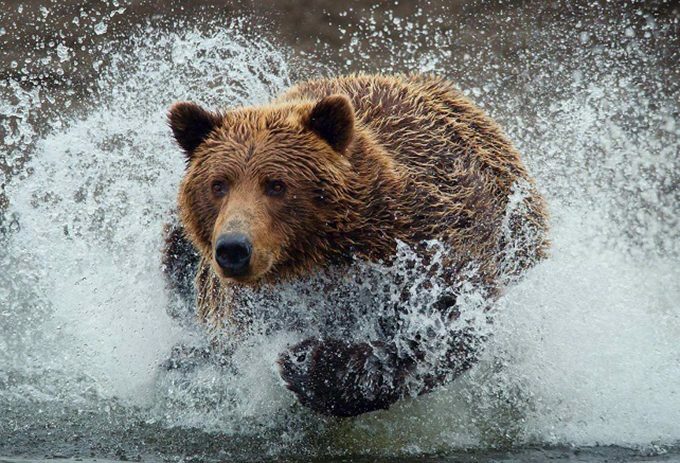 The maximum speed a bear has been known to the clock is 40 mph. That’s on flat ground, and because of that a myth spread around that bears can’t run downhill. You should know that couldn’t be farther from the truth, so don’t try to run away from a bear, even if you’re doing it downhill. People can’t run as fast as bears. Usain Bolt is the fastest person today, and he can only do 28 mph. If you’re running faster downhill, so does a bear, so its speed is definitely bigger than 40 mph now. When you’re running under a lot of pressure, you’re not paying enough attention to the road ahead, and the fear can make you trip and fall. 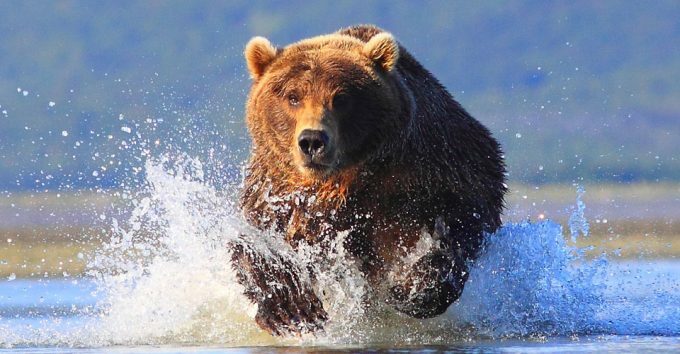 Research has shown that running plus the speed a bear reaches is the number one reason why people get killed when coming face to face with a bear. 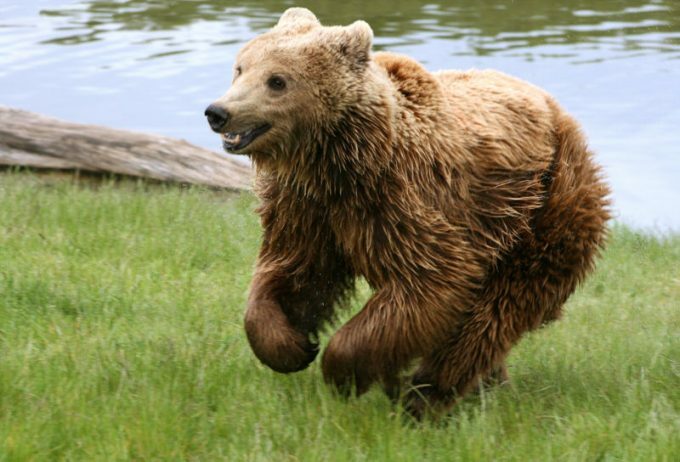 However, different species of bears end up running with different speeds. Some sources indicate 37 mph for a black bear, while others go as much as 40 mph, but it’s in the same general area. Grizzly bears are somewhat slower, with just 30 mph, but it’s still not a good idea to mess with them either. If you’re wondering how fast bears are, you must also ask yourself how long can they do it for. Speed is an important factor when it comes to escaping a bear attack, but so is endurance. Besides, what if you have a head start? Can that help you outrun a bear to safety? So we’ll tell you again: the unfortunate truth is that you can’t outrun a bear. Let’s say you’re Usain Bolt, reading this article. If you’re racing a black bear towards a shelter that’s one mile away, you would need 2 minutes and 8 seconds. The bear would only need 1 minute and 37 seconds, provided its speed is 37 miles per hour. Terrain. Running at an incline might make you even more tired, faster. Even if you’re running downhill, you can trip and injure yourself, thus taking you out of the competition. Weather. If it’s raining, the chance of you slipping is exponentially increased, plus it ruins your morale apart from your sight. If it’s windy, air friction will make you run slower too. Needless to say, bears are less affected by weather than people are. Your emotions. If you’re scared, you might pay less attention to where you’re headed and might make impulsive decisions like taking a dangerous turn to make you fall. Or it might completely motivate you to run faster. How determined the bear is. If you’ve messed with a mama bear that wants to defend her cubs, you’ve really done it. 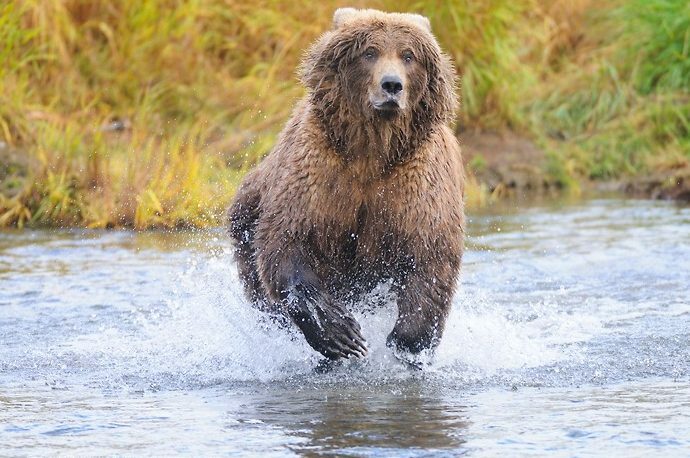 The female bear will chase you for longer than a male bear who’s just interested in scaring you away. You’re probably not Usain Bolt. That’s self-explanatory. Another factor is: bears really have a lot of endurance apart from speed. 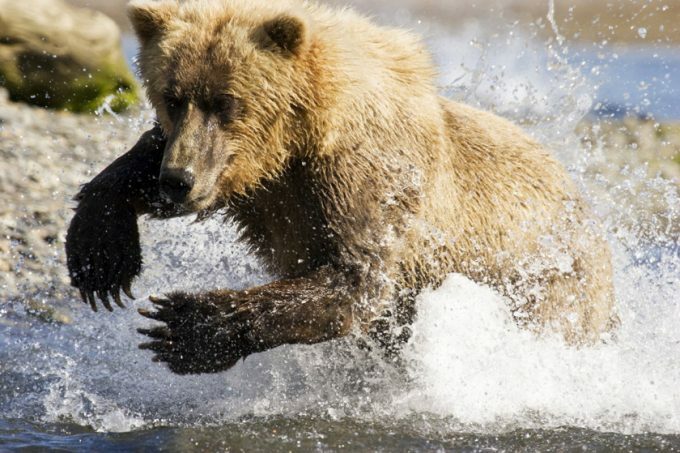 There’s been some research done with bears from the Yellowstone National Park, and it’s been found that grizzly bears can keep up a speed of 25 to 28 miles per hour for at least 2 miles without getting tired. 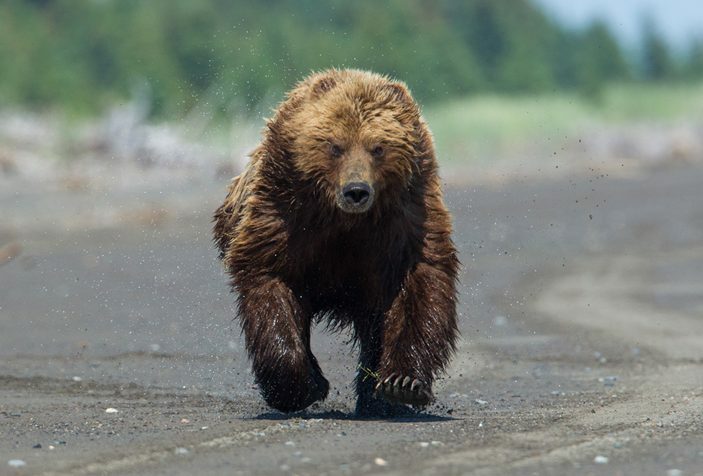 If they’re running faster, at 30 mph, they can do that for a little more than 0.25 miles.The most interesting fact is that these findings relate to bears running on asphalt, which is a terrain they’re not built for. If they’re running in the woods, they can be faster. So here’s another factor for you: if people are slower on dirt because of a worse grip, bears are faster because they’re using their claws to get more momentum.What’s the endurance of Usain Bolt?A couple of seconds, so you do the math. Basically, if we’re talking about head starts, you would need 2 miles, not 0.32. In real conditions thanks to a little thing called endurance.Can you see the bear when you’re 2 miles away from each other? No, but it can definitely smell you. So the race might be on, even when you don’t know it’s on. That’s why in real life, you can’t even think of getting a good enough head start to save your life. How can bears be that fast? Apart from the question of how fast bears are, a few others are equally important. It’s weird that nature has allowed these mammoths this kind of speed and endurance. It almost doesn’t seem physically possible to run like that when you’re built like that. Consider that bears run even faster than more supple creatures of the wild. Plus, they make very precise turns even when they’re running at their maximum speed. Doesn’t their speed defy the laws of evolution? Apart from being able to run so fast, why should they have to? From an evolutionary standpoint, it seems a little far-fetched, considering that bears are opportunistic omnivores, not agile hunters like the cheetahs. So they could have adapted to the environment easily, without becoming such great runners. Shouldn’t their physical traits prevent them from running? They don’t have long tails to give them more momentum. Their fur makes up for a lot of air resistance to decrease their speed. They don’t have mobile spines. Their eyesight is really lacking so they can’t identify a prey that’s further away. They considerably increase their fat deposits during hibernation, but that doesn’t decrease their speed or their agility. When it comes to running, strong muscles do the work. Even if you don’t have an aerodynamic shape, air friction isn’t that big to face the momentum developed by huge muscle mass. For instance, there are stout looking cars that reach even bigger speeds than sleek looking ones thanks to high-power motors. Basically, their strength is so remarkable that it’s no match for wind resistance, and it seems to defy the laws of gravity too. A bigger weight keeps you more stable, especially when you’re making fine turns at a high speed. That’s because you have to fight the centrifugal force and stay on track. Plus, stout and heavy objects have their center of gravity closer to the ground, so they tend not to lean forward when running or sideways when making turns. When we’re talking about speed and endurance of a bear, that’s all about energy. And if the bears have all those fat deposits, they can easily burn them off to keep them on track for longer, without getting tired or losing their momentum. 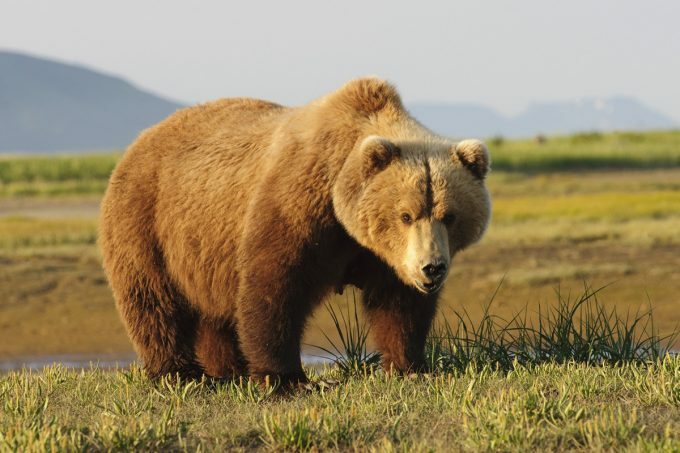 Speed needs acceleration, and grizzly bears can get from standing completely still to 30 mph in less than two seconds. They have a lot of horsepower, and their big weight contributes to that. How muscular the animal is. How thick its tendons are. The way in which its leg bones are arranged. How long its leg bones are. How flexible its spine is. So even if bears don’t have some of the above characteristics, they have others that help them accelerate, which explains their high speeds. Plus, they’re not the fastest in the animal kingdom, so no paradox there. Even if sleeping for months at a time would cause us to become a flabby mass of goo, that doesn’t happen to bears. Evolution has helped them conserve muscle mass, while also putting on a layer of fat on top of it. So basically, there’s no reason why a bear wouldn’t be as fast as before when waking up from its slumber. Yes, it has a few extra pounds on, but it’s also rested and hungry, so that counts more. 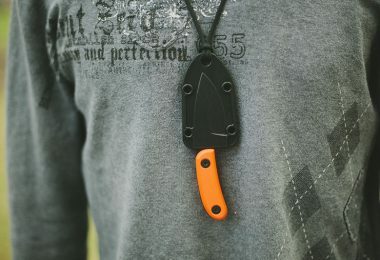 For more hiking 101 and other safety tips, check out our article on this topic. What’s your plan in case of a bear attack? 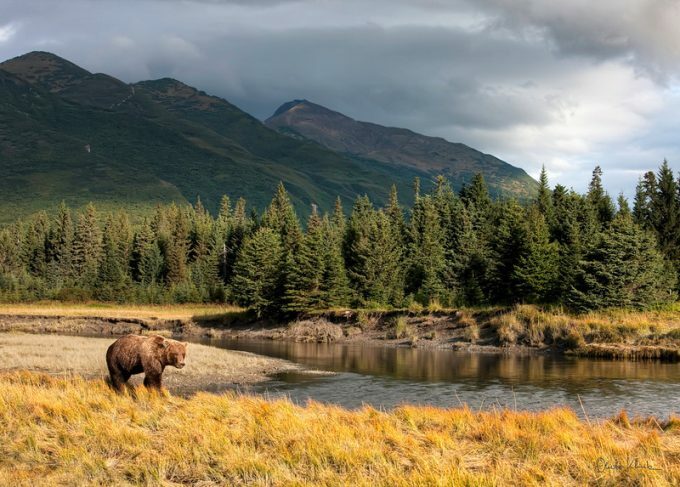 If you’re hiking somewhere you know there are bears, chances are you’re going to stumble upon one because it’s their territory. So what do you do if that’s the case? Check if there are bears around, by scouring the horizon minutely. If you have binoculars with you, it’s even better. Let the bears know you’re around through loud noises to scare them away. 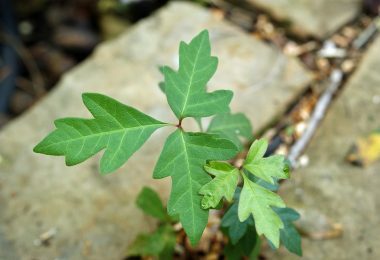 Look around and keep track of any trees you could climb on. Make sure you can do that fast because bears can climb trees themselves, up to about 30 feet. That usually happens when the bear is at least 350 feet away from you. Don’t let the bear know you’re there. Walk backward slowly and leave lots of room for the bar to retreat. It’s better to leave altogether and follow a new trail. If you need to stick to your path, make sure you turn around as much as you can and stay there until the bear leaves. Move downwind for as long as you can, so the bear doesn’t sniff you out. Act normally, give the bear a chance to acknowledge your presence. Start speaking in a calm, relaxed way. Don’t scream or shout. Keep facing the bear as you move away. You should definitely look for another route now, but upwind so the bear can keep track of you. Don’t stop talking even after you’ve completely lost track of the bear. It still knows you’re there. There’s a black bear involved. They can run faster, and they’re also more aggressive than grizzlies. There’s a mother with cubs. This is worse because she’ll instinctively see you as a threat, even if you’re not. There aren’t any trees around. That means you’ll have no way to take shelter. You don’t have plenty of time to climb in a tree. Remain calm. Yes, we know that’s easier said than done. Don’t run. 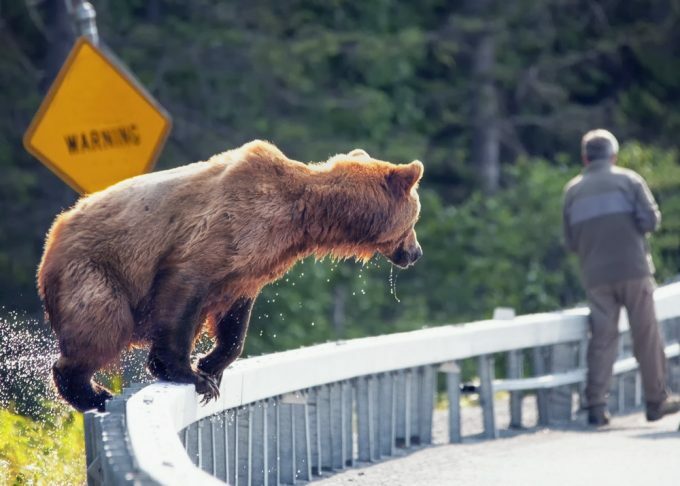 If you’re wondering how fast bears are, now is not the time to find out. Running will activate their prey instinct and they’ll chase you down. So if the bear wants to attack, running won’t deter it. Try to back away very slowly. Keep the bear in your front and act with calm, speak in a low tone of voice and don’t scare it. 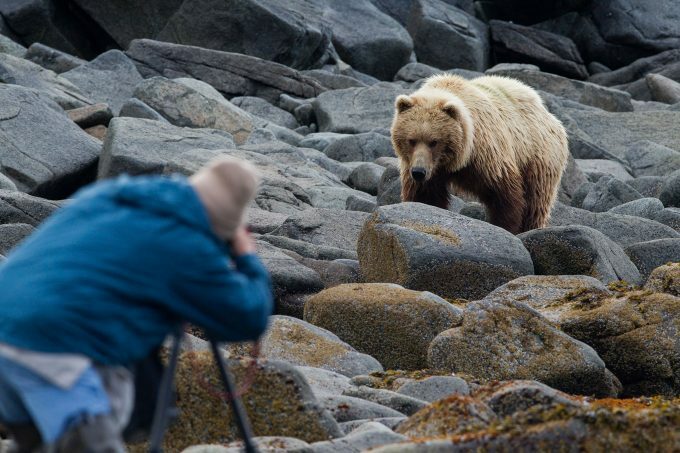 Try to avoid making eye contact because that is a sign of defiance and the bear will see you as a threat. Don’t throw away your backpack hoping the bear will show more interest in that, you need to use the backpack as a shield if push comes to shove. Try to climb at least 30 feet up a tree. Even if you can’t get that high, you should still do that in order to be perceived as less threatening. Although the bear can climb after you, you’re actually hoping it’s not going to want to. In the case of a charge, consider it’s probably a bluff. Bears are known to do that in order to scare away a perceived threat. Keep your calm, and continue backing away. Don’t use pepper spray unless you’re 15 feet or closer to the bear. Otherwise, it won’t have any effect and the bear will see you as a threat. Or it could be even worse if it’s windy. 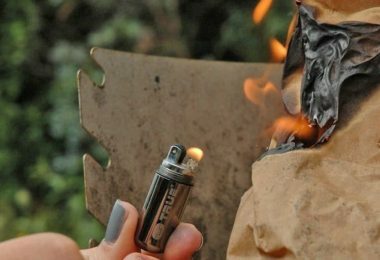 See our article on the top bear pepper spray to use when an encounter is imminent. Point the spray level with its eyes before using it if you’re less than 15 feet from the bear, calmly (yes, we still realize how that sounds). You’re doing this to confuse the bear at least, if not to stop it altogether, and buy yourself some time. In the case of an actual attack by a black bear, you shouldn’t play dead. Fight the bear as much as you can because black bears can easily be scared. Plus, you don’t have any other option if you’ve been attacked, especially at nighttime or when a female bear is involved. Use anything you have as a shield and cover your head and chest above anything else. If you’re attacked by a grizzly, it’s better to play dead. The reason is that most grizzly try to fight you to protect themselves, and you’re telling them you’re giving up. You can show you’re non-threatening by adopting the fetal-like position, with your legs covering your chest and head. Another good position is lying face down, in order to protect your face and chest, with your backpack covering your back as well as the back of your head. It’s wise to see playing dead as a last resort because you need to keep your eyes on the bear to adjust your tactics for as long as you can. If you’ve escaped the attack, now is definitely the time to stay calm. Don’t get up for a few minutes to give the bear enough time to walk away. So don’t start running and shouting for help immediately since that can definitely seem threatening to the bear. Although, if you are able to run and shout after a bear attack, more power to you. Are you hiking by your lonesome? Then check out our must-read piece on tips when hiking alone on the trail for more information. 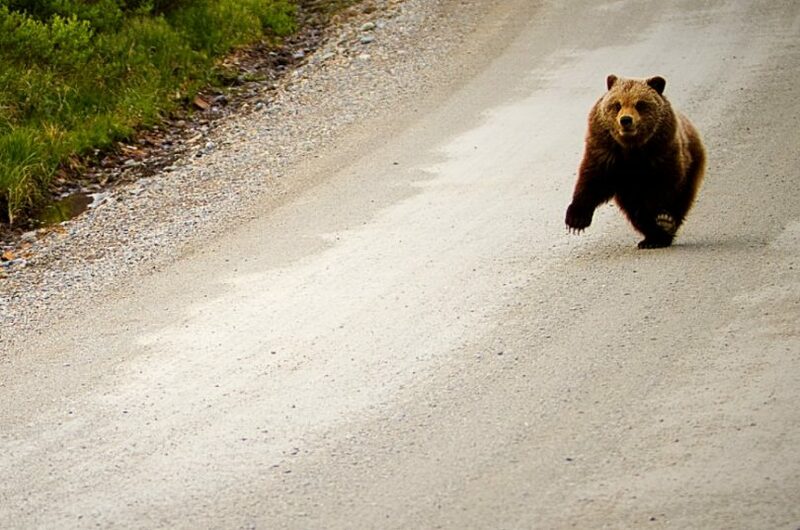 Apart from the fact that bears are really fast, it’s wise not to mess with them. There are lots of possible explanation how they became so fast, even if it does seem weird for us. But even if they’re faster than people, they’re definitely not the Usain Bolt of their species. Remember a bear can still catch you whether you’re running up or down a hill and don’t try to outrun it. There’s no way you can even have a realistic head start. 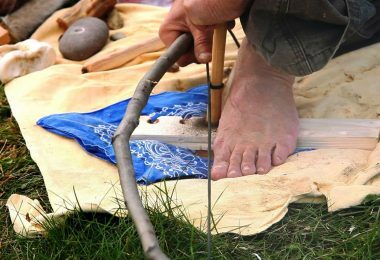 Read our article on basic camping and hiking safety to give you more protection and ease of mind. With that said, let us know if we’ve missed something. Are there other myths or fun facts related to the speed of bears we didn’t mention? 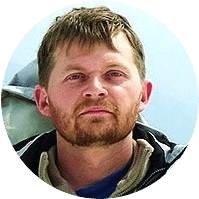 Have you ever had a third-degree encounter with a bear? The comments are right below!